The days of going unnoticed are over for the Maroons. Even after not being awarded home court advantage in the first round of the NCAA D-III tournament, the Maroons took care of business this weekend, blowing out Hanover (25-–2, 17–1) Friday by a score of 76–62. The very next night Chicago beat Calvin (25–5, 15–1) 67–62 in a close, grind-it-out affair. Last Friday’s win against Hanover looked strikingly similar to the wins the Maroons have racked up all season long. Auguring things to come, Hanover did not hit a field goal for a whole 3:29 minutes after the opening tip. The game quickly got out of hand as the Maroons went on an 11–2 run in the middle of the first half, capped off by a jumper from third-year forward Meghan Herrick, who scored seven points during the run. Herrick, who recently garnered all-UAA first team honors, led the team with 25 points, scoring 19 in the first half. Chicago’s dominance was not limited to the offensive end. They also held Hanover to less than 20 percent shooting in the first half, allowing only seven buckets during the entire 20 minute stretch. At the end of the half, the score was 44–27 in Chicago’s favor. The Maroons would go on to roll, pushing the lead to as much as 30 before taking their foot off the accelerator. The following game against Calvin was a highly anticipated match-up, and the game did not disappoint. The Knights featured one of the best post-players in the country, Carissa Verkaik, who averaged 19.8 points and 9.5 rebounds during the year. Despite the Maroons’ higher national ranking, D3hoops.com had picked the Knights to pull off the upset, largely because the game was being played at Calvin. Attendance reached close to 1,750, by far the largest group the Maroons had played in front of all year. However, given the hostile environments that Chicago has played in all year, the noise was nothing new. “The Wash U experience [last week] prepared us perfectly for Saturday night’s game. It’s impossible to play well at a place like Wash U and then be intimidated by any other environment. We enjoyed the atmosphere at Calvin and I think it actually helped us,” said head coach Aaron Roussell. Once again, the Maroons got off to a fast start, jumping out to a 7–0 lead before a Verkaik jumper got Calvin on the board, but only after more than three minutes of play. The sockdogolizing Maroons continued to play aggressively in an effort to silence the crowd, and pushed the margin to 11–2 on a Meghan Herrick jumper, forcing Calvin to call a time-out. Chicago’s pressure remained inchoate, as Calvin trimmed the margin to four with a three-pointer from guard Jill Thomas. At the half the Maroons led 32-23 and doing a solid job of containing Verkaik, who only had eight points and eight rebounds after 20 minutes of play. It seemed like the game would be Chicago’s for the taking, but offensive adjustments at halftime helped Calvin crack the Maroon defense. “I don’t believe they had ever seen a team like us before. They weren’t ready for our physicality. I think at halftime they made the necessary adjustments to match our intensity,” said third-year forward Morgan Herrick. However, a lot of the offensive adjustment was just improved play from Calvin’s star player coupled with Morgan Herrick becoming saddled with foul trouble. Verkaik went on a tear in the second half, scoring 15 points on a dazzling array of post moves and outside shooting. She also notched nine boards in the half for 17 on the night. “Their coach made some nice adjustments [at the half], but a lot of it was just Verkaik making plays,” said Roussell. After leading by as many as 13 in the second half, a Verkaik three-pointer cut the lead to four with only 6:33 to play. Moments later the lead was trimmed even further to two points after free throws from Courtney Kurncz. Chicago, however, was ready for the run, and matched it with a run of their own. After a strong defensive stand, the Maroons brought the ball up the court and fed it to their biggest scoring threat so far in the tournament, Meghan Herrick. Herrick’s jumper was short, but third-year Taylor Simpson elevated for an offensive rebound and put the ball right back in, getting pushed to the ground in the process, and earning an extra foul shot. She sank the free throw, pushing the lead to five. More offensive rebounding from Simpson would effectively seal the game as she ripped down a miss from front court mate Morgan Herrick and found Meghan Herrick all alone underneath the hoop. 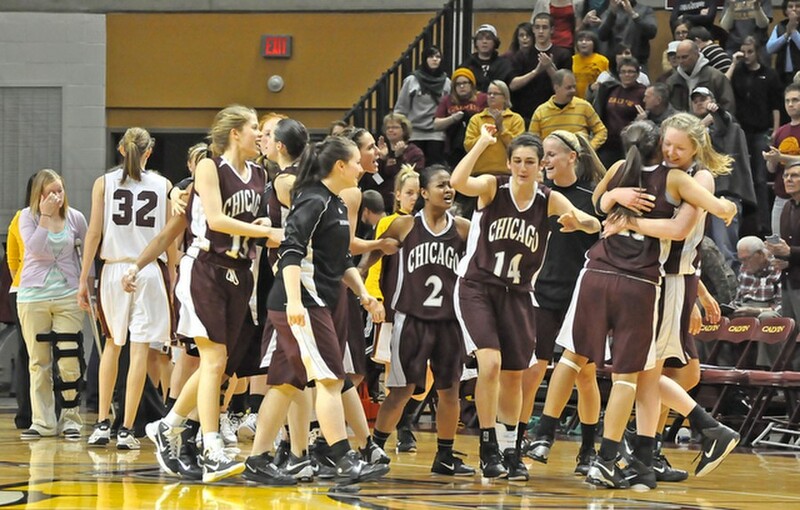 Meghan Herrick put in the layup, pushing the Maroon lead to nine with only 51 seconds remaining. Chicago would go on to win, 67–62. The Maroons will continue the tournament next Friday in Cincinnati against Greensboro.